If the Fish and Wildlife Service agrees to list the giraffe, a set of legal tools will become available to protect this iconic species. But how would listing in the U.S. help this African mammal, whose population numbers in the wild have dipped below 100,000 ? More than a century ago, scientists began to notice the disappearance of once prominent species around the world. The American passenger pigeon , the Carolina parakeet and the Great Auk – once well-established in North America – disappeared. Other species like the American bison and many kinds of whales had once played central roles in important ecosystems but had been reduced to small remnant populations. In 1964, the International Union for the Conservation of Nature (IUCN) began tracking the conservation status of species on its “ Red List .” Although the IUCN provides information only about the status of species, this is the first step in helping to limit extinction because it allows conservation efforts to be directed where they’re most needed. Evidence suggests the ESA works. 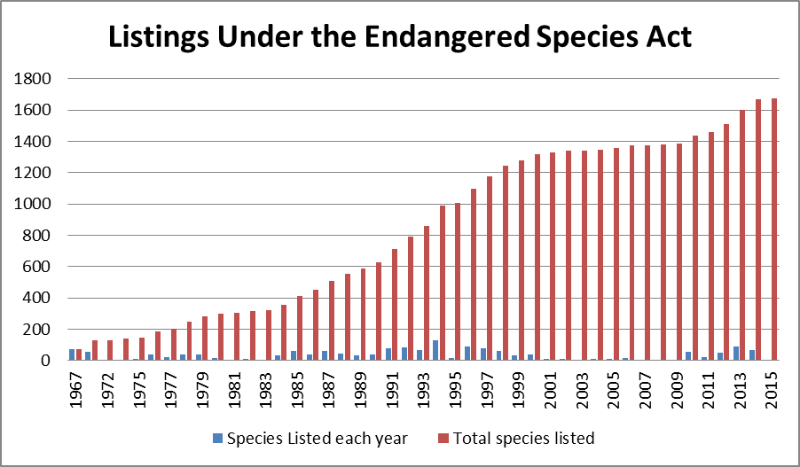 A recent report in the Endangered Species Bulletin noted that of the 78 species first listed under the federal precursor to the Endangered Species Act in 1967, only four have been officially declared extinct after half a century. Many others, such as the California condor, the grizzly bear and the whooping crane , have seen remarkable recovery progress . Some, including the bald eagle , have even been removed from the list. An international treaty, the Convention on International Trade in Endangered Species of Wild Fauna and Flora (1973), known by its acronym, CITES, also addresses this problem. Countries that are party to the treaty meet periodically to list species that are threatened due to international trade. The treaty has two appendices for listing species: Appendix I results in an almost complete ban on commercial international trade; Appendix II requires all international trade in that species be monitored and subject to permits. The giraffe is not currently listed on either of the CITES appendices , but this does not prevent individual countries – such as the United States – from deciding to limit imports.